In our October edition of our Preemie Family newsletter we learned about Ayla Capri Hall, who was born at 32 weeks, weighed in at 3 lbs. 2 oz. Ayla spent 67 days in the NICU before coming home. Read more in an update by her mother, Emma Hostetter (who is also heads up The Mom in Me, MD). 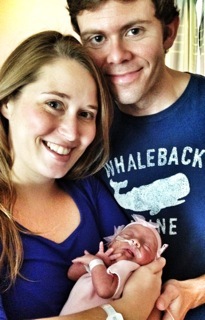 Our daughter was born unexpectedly early at 32 weeks gestation. I was diagnosed with severe and sudden onset preeclampsia which required an immediate emergency c-section. My daughter, Ayla, was born weighing only 3lbs 2 oz. As soon as she was delivered, she was resuscitated and then whisked off to the NICU where she was intubated and given surfactant. For the next 9 weeks, Ayla learned how to feed. It was more than a challenge, but she eventually got the hang of nursing and bottle feeding. We faced the typical preemie challenges of horrible acid reflux, bradycardias, and laryngomalacia. Eventually, we were released from the hospital, but not without a home apnea and bradycardia monitor. After several months, the monitor was no longer necessary. Thank goodness! medicine saved both of our lives. Today, no one would even know that she had a tough start to life.